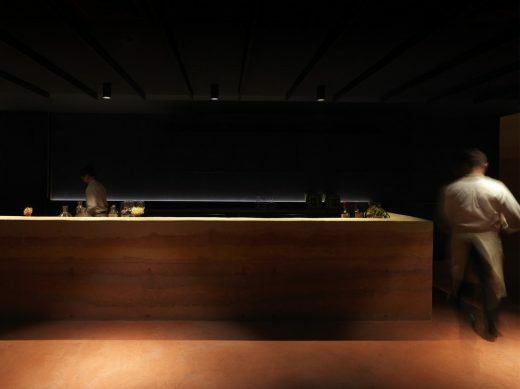 Innovative Australian cross-disciplinary interior architecture practice, Foolscap Studio was selected to design the Noma Australia restaurant fit-out from concept to delivery matched to Noma’s globally celebrated culinary force, chef Rene Redzepi. The designers reveal how they applied their unique identity mapping and elemental design approach to concept development and the design process to deliver a dining experience befitting Noma’s identity and menu. 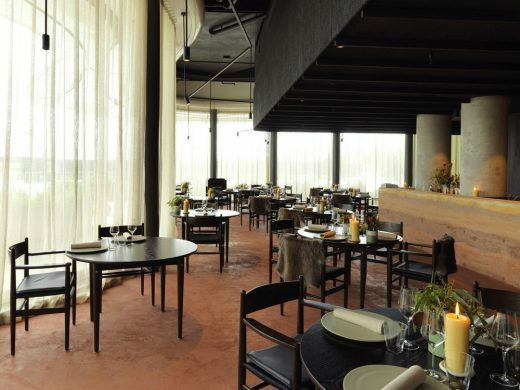 Noma Australia is a temporary restaurant for Noma Copenhagen sited within the sculptural Anadara building in Sydney Australia’s Bangaroo precinct on the western edge of Sydney Harbour. 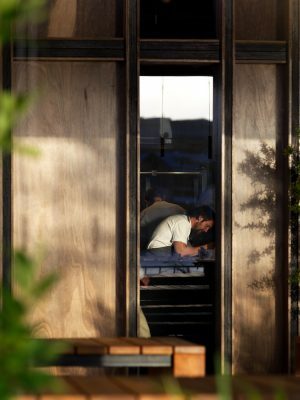 Noma’s flagship has been placed at the top of Restaurant magazine’s World’s Best Restaurant list on four occasions (2010, 2011, 2012, 2014) since their 2003 opening. Their 10-week Australian residency sold out within 5 minutes. Developer Lendlease partnered with Tourism Australia to bring Noma to the waterfront of Barangaroo Sydney. Foolscap Studio were appointed for the project, and worked closely with Lendlease design and Noma in delivering the concept through to detailed design. Responding to Chef René Redzepi’s design brief for ‘something ‘uniquely Australian’ that reflected the preparation of native ingredients sourced from coastal regions and surrounding bush and prepared using fire’ – led Foolscap Studio to create a dining experience centred around the natural elements of land and water. The depth and breadth of Foolscap Studio’s talent pool, diverse skillset and folio showcasing their multi-disciplinary project capabilities from design concept through to delivery, across multiple sectors, Australia-wide – resulted in an invitation to discuss some initial conceptual ideas with world acclaimed Noma for their Noma Australia project. Furthermore, Foolscap Studio had intimate knowledge and understanding of the proposed site, having successfully delivered hospitality and public domain projects within the large Sydney Bangaroo precinct. 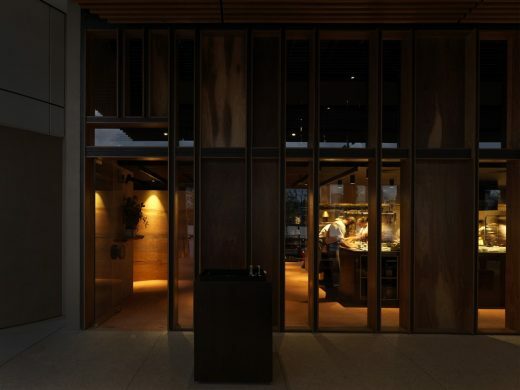 After the concept ideas clearly resonated with Noma, Foolscap Studio was selected to develop the concept in detail and to personally present that to Noma Head Chef René Redzepi and his team, onsite in Sydney. Foolscap Studio travelled to Noma Copenhagen for an immersive experience and knowledge-gathering mission to fully understand Noma’s DNA. The intimate understanding gained of everything from the diner’s personal greeting at the door by Noma chefs, the people, and the level of precision and technical requirements of the kitchen – down to the millimetre – directly informed the designer’s response. • Noma do what they say – they’re constantly foraging and finding the best ingredients available. • Noma is always working towards creating the best possible culinary experience. 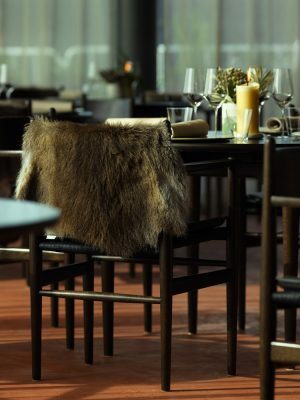 • Noma is ‘always with the guest’ – they serve guests in a way that is unexpected. 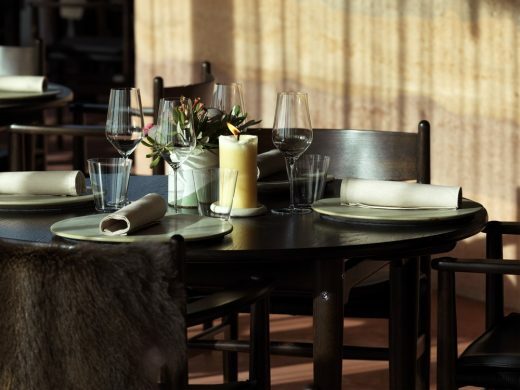 • Noma is humble – despite being one of the top restaurants in the world. 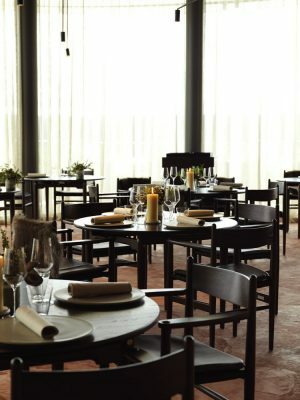 • At Noma – high quality is paramount but things don’t need to be over-formalised. Noma’s thinking, sourcing and philosophy towards their ingredients provided the starting point for Foolscap Studio’s elemental design approach to Noma Australia. “It was an opportunity for us to turn up the volume on a process that was quite natural to us,” says Das. The Noma dining experience created by Foolscap Studio is based around elemental materials: honesty to materials and process, understanding the origins of the materials and exploring what they represent through narrative and the semantics of the material and the forms once they are built. “Foolscap Studio’s elemental design concept: land and water for Noma Australia reflects the elemental quality of the Australian landscape and its materials through references to its rugged oxidised earth, salt lakes, sweeping coastline, open sky and horizon, and the regeneration of native plants through fire,” says Winteridge. “The concept explored how to seamlessly bring together Noma’s identity and Australia’s identity in a complimentary way that made sense. 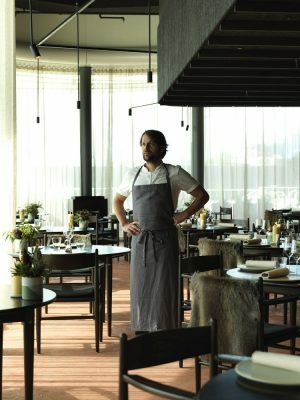 Noma’s thinking and approach was captured within Australian materials, while select Danish details complete the narrative: an inversion of Noma’s Nordic thinking within an Australian context,” adds Das. Natural elements of material were explored to create a materials-driven experience for patrons from a restrained and limited palette comprising: earth, timber and glazing and materials in between. The concept of ‘land’ is represented by solid mass, weight, charred’ textures and earth, while the concept of ‘water’ is represented through light, shadow, glass and spatial volume. 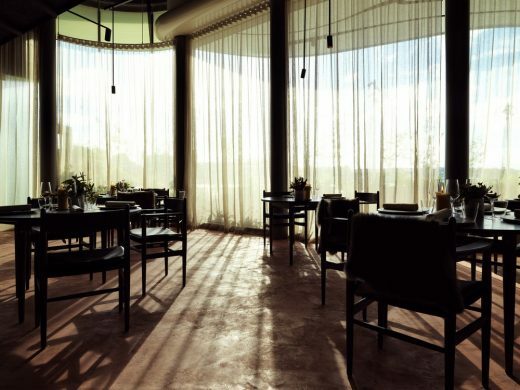 To reflect the earth and sea from which each ingredient on the Noma menu is sourced – Foolscap’s interior architecture deliberately utilises native materials and processes that have been specifically developed with local suppliers and makers. 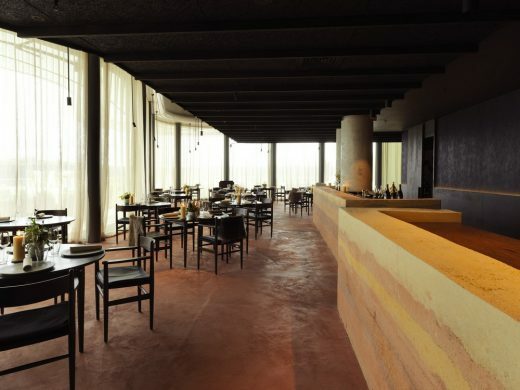 A dining room experience anchored by three key materials that were applied and formed by hand on-site: RAMMED EARTH has been used in an unconventional way by Foolscap forming three large monolithic rammed earth walls (the dominant design element in the space, each up to 6m long) to showcase the beauty of the archaic process and the locally sourced raw material. 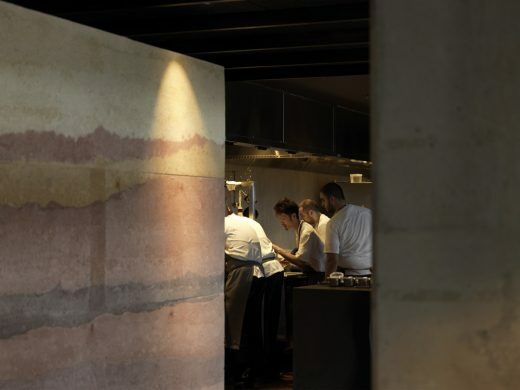 The idea was to reflect the sedimentary land formations found across Australia and the various locations from which the native ingredients for Noma have been sourced. 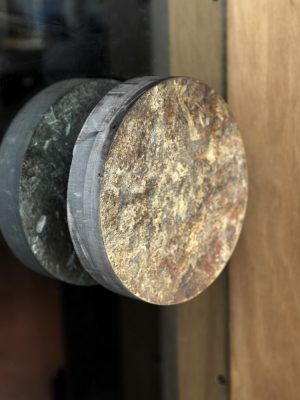 To achieve the effect, Foolscap worked with a specialised earth builder to develop and formulate the materials, which have been built by compacting layers within a formwork, each layer was separately coloured using specially developed oxides. PLYWOOD LOUVRED SHOP FRONT FAÇADE is handcrafted from native Australian plywood to resemble a vertical abstraction of the natural bushland. The sustainably sourced material was chosen because it was easy to construct with and panels can be re-used. The façade was developed alongside Lend Lease. AN OXIDISED FLOOR TREATMENT (specifically formulated render material) forms a continuous surface through the space to create a textural surface. 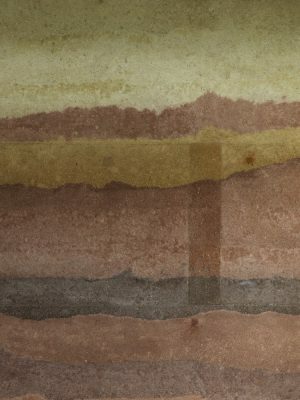 The material texture borrows from aerial photos of salt lakes near WA, a reference to water. A restricted material palette overlaid with the idea of regeneration – the way that bushland and plant life within the bush regenerates through fire to reflect Noma’s use of fire. The flame and cooking with fire on an open industrial BBQ and smoking chamber visible on entry to Noma references both the ancient use of fire for cooking and BBQ use as part of contemporary Australian life. To depict Danish identity in an Australian context: everything that was part of the architecture (the landscape) is Australian, while Danish details were overlaid as surface treatments and loose items. 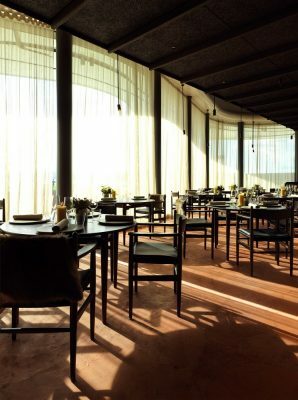 There’s the idea that the diner is: eating from Australian crockery but with Danish cutlery from Noma and sitting within an Australian landscape/building but looking through this porous Danish Kvadrat curtain material.” The ceiling is a Danish acoustic material made from thick paper fibres and black in colour. A contemporary take on the classic Australian verandah – connecting interior and exterior is the way the kitchen frontage opens out to the outdoor prep and seating areas, located under a four metre high cantilevered awning. Cast concrete vases individually hand crafted and custom coloured to create organic layering inspired by Australian landscapes and colours. created by Studio Twocan. HAND BLOWN GLASS WATER AND JUICE VESSELS designed and made by Brian Hirst glass artist were custom developed with Foolscap Studio. WOVEN PIECES by indigenous makers including: Elcho weavers BLUESTONE DOOR HANDLES stone sourced from the Kanmantoo Stone Quarry in the Adelaide hills TASMANIAN WALLABY PELTS DRAPED OVER CHAIRS a playful substitute for the Danish fur found in Noma chosen because they are a by-product of sustainable wallaby meat production. 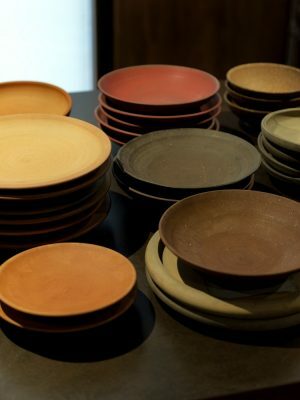 TABLEWARE designer makers Paul Davis and Jacqueline Clayton developed custom stoneware clay mixes using all Australian clays. The majority of pieces are left unglazed, leaving the ‘tooth’ or texture of the clay body exposed. FLORAL ARRANGEMENTS BY JOOST based on the concept of ‘native species that regenerate through fire’ that’s relevant to both Noma and Australian culture. CEMENT CERAMIC VASES designed and hand crafted custom coloured to create organic layering inspired by Australian landscapes ARTWORK Art by Australian artist William Delafield Cook called Dam2. 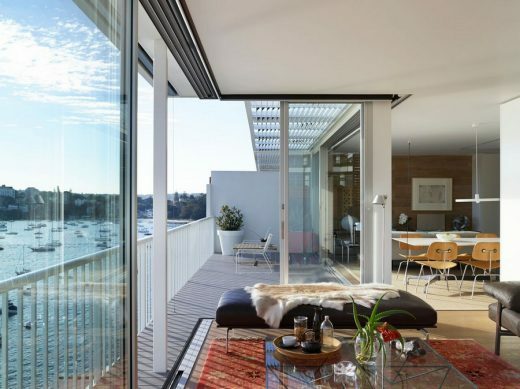 DEVELOPER: Lendlease partnered with Tourism Australia to bring Noma Australia to the waterfront of Barangaroo Sydney for a 10-week residency. Foolscap worked closely with Lendlease design to develop specific design components including the façade and ceiling bulkhead. SOLD-OUT: The 10-week residency opened on Australia Day 2016.